Photo Writing - Exploring Photography. : Wandering in the wilderness - photographic recce of the Tuli Block. I've just gotten back from spending some time in the beautiful Tuli Block just north of the South African border in Botswana. I traveled through with African Impact to look at the possibility of putting together a workshop there at some point in the future. I'm really happy to say that having spent just under a week there, I can say that it isn't a possibility, it's a definite! Crossing the border into Botswana you immediately find yourself surrounded by the orange and green leaved Mopane trees that stretch in every direction. The land is basically flat, but dotted with raised mounds of sandstone that pop out like giant molehills. The only other thing that rises above the tops of the Mopane Trees are the enormous baobab trees that raise their incongruous branches up to the clear blue sky. A reddish dust fills the air behind like a giant squirrel's tale as the vehicle travels over the dirt road toward your destination. 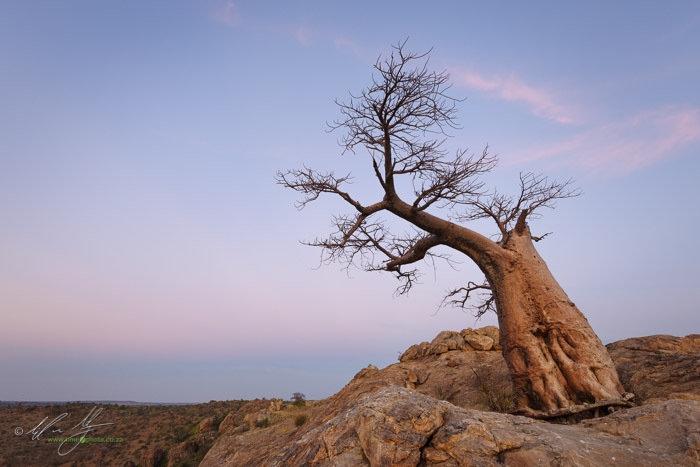 The destination being Tuli Wilderness Safaris. The property sits on the northern banks of the Limpopo River, with the tented Serolo camp settled a little further back under the shade of an enormous and wizened looking Nyala Berry Tree (locally referred to as a 'Mashatu Tree'. Stuart, a character out of a novel and Jon Jon are our hosts and guides, to Natascha (of African Impact) and myself. Stuart is the owner of Tuli Wilderness Safaris and is a character larger than life. His infectious laugh bursts out into the African night as he regales us around the fire. Long hair, and bushy beard allow mischievous eyes to peep out from under the his worn khaki peak cap. He is very obviously in love with the land around him as he tells us of all the places that we need to visit to photograph. Opportunities for star trails, landscapes and wildlife photography abound. Stuart, the owner of Tuli Wilderness Safaris, points out that Tuli isn't really like other game reserves where you go to see the animals. Certainly there is no shortage of wildlife in the Block, but it is the wilderness itself that makes Tuli special. Although the opportunities are there to see lion, leopard, cheetah, hyena, innumerable game species and the ever present elephants, the landscape itself seems to beckon to the visitor. 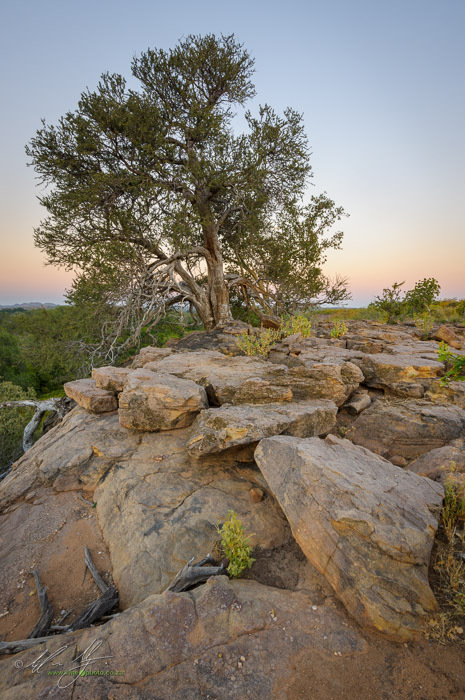 Standing atop Eagle's Rock, a giant spit of sandstone that overlooks the Motlatse River, I cannot help but agree with him. Something that really stood out for me, apart from the humps of sandstone, were the incredible variety of trees. Not just any trees, but trees that seemed to shout out to be photographed. Shepard trees and Mopanes fought with giant Figs in their level of photographic interest. Around every corner there seems to be another tree with such tremendous personality in its boughs that it is hard to travel down the round without urging Jon Jon to stop the land rover. For a photographer who enjoys trees, this area is heaven. It only got better as the trip continued. I ended up spending two nights on trail with Stuart and some travel agents and a journalist doing a piece for the Cape Times. Tuli Wilderness Safaris offers this incredible wilderness experience where you are guided on foot through the bush between spectacularly positioned 'bush camps' in the middle of seemingly nowhere. 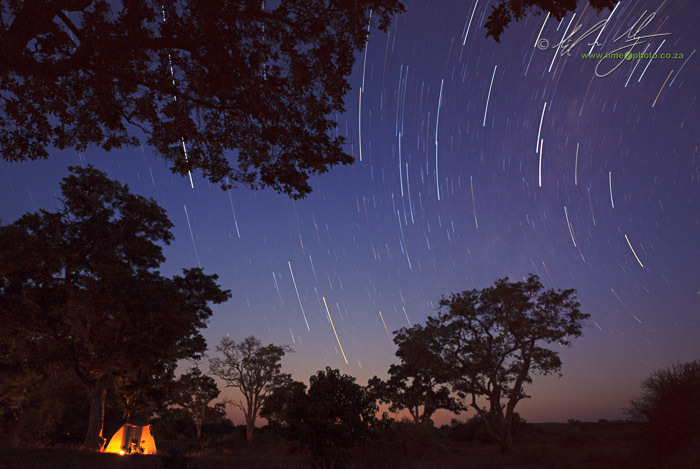 Each camp offers making opportunities for photography as the sun sets and the stars suddenly spring to life above. 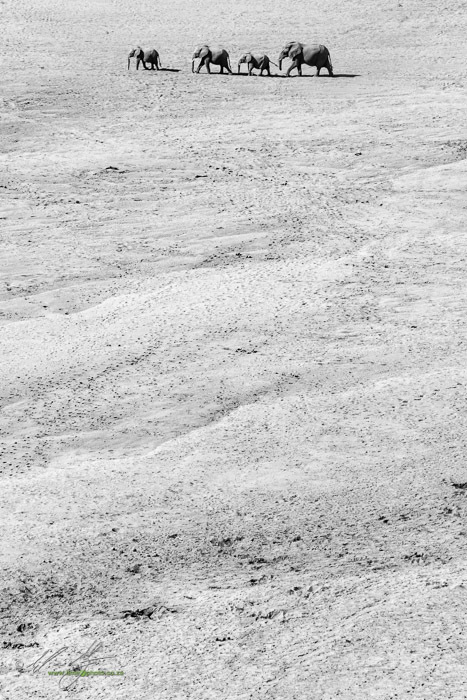 The vast openness of the Tuli means you watch as Scorpio rises perfectly over the horizon. The Milky Way seems to explode out of the darkness above. An Impossibly luxurious campsite is a welcome reprieve from the Tuli dust while Annelien, Stuart's wife becomes this miraculous host and chef in the middle of the bush. You cannot see the wilderness in more comfort than this. I was blown away. Stuart is characteristically humble about this, but the experience is phenomenal. The Tuli Block is not about the wildlife, or so Stuart explains. Again, I agree with him. While walking, we saw an enormous herd of elephant crossing the Motlatse River, glimpsed a Brown hyena at close quarters and tracked lion for hours, but it's not about this. It really has everything to do with being in the wilderness. Totally immersed in the wilderness. There are no phones (unless you're with MTN - but really, leave the phone at home), no cars, no sirens, no planes, no electricity, no politicians, no work, nothing that usually seems to matter. Instead all the hectic bustle that we fill our lives with is replaced by the sawing sound of a leopard calling, the friendly tootling of elephants some 100 meters away in a clump of Apple-leaf trees, the yipping of jackals, impala barking at each other (it was rutting season), the guttural moan of lion and the panoply of stars that hang like a million fairy lights from the sky. 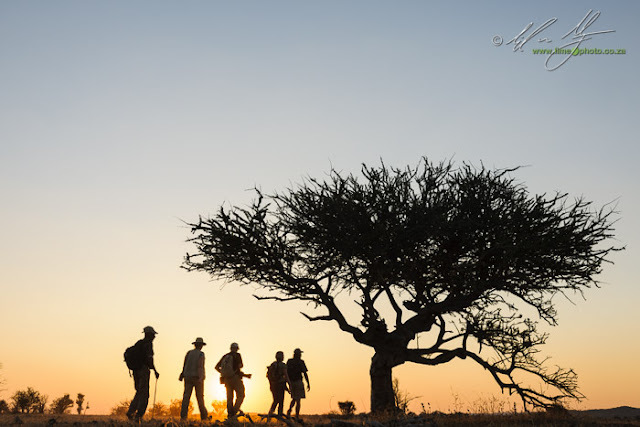 So to the nitty-gritty, yes there will be a workshop in the Tuli later this year, hosted through Limephoto and Tuli Wilderness Safaris (backed by African Impact who will also be doing logistics and bookings) It is not going to be a wildlife photography workshop. There are enough of those out there. I'll be putting together a wilderness photography workshop. Details will be posted on the website and blog soon. It promises to be an amazing 4 nights filled with photography and an unrivaled experience of the bush. I cannot wait!